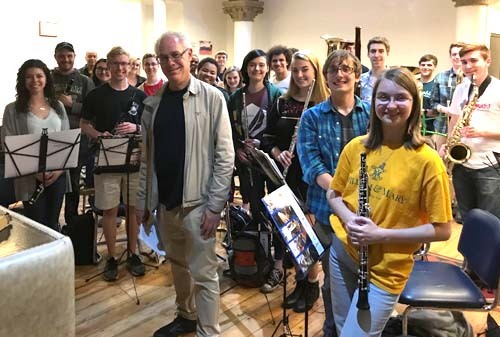 This past May, students in the W&M Wind Ensemble toured Great Britain, performing at various venues and holding a working clinic with British composer Adam Gorb. The tour was funded in part by the Arts & Sciences Annual Fund. “The workshop we had with Professor Gorb was especially interesting, as it gave me a deeper appreciation for the music we played this semester and for music overall,” said Sarah Thompson '21. “This trip allowed me to grow as a musician.” At their London concert, the ensemble performed Gorb's piece Summer Dances. During the 2017-18 academic year, the ensemble performed a piece by a British composer at each of its concerts as it prepared material to perform during the tour. The ensemble performed concerts at the National Centre for Early Music in York and at St. George’s Church, Bloomsbury, London. Their first performance was at the High School of Dundee, Scotland. 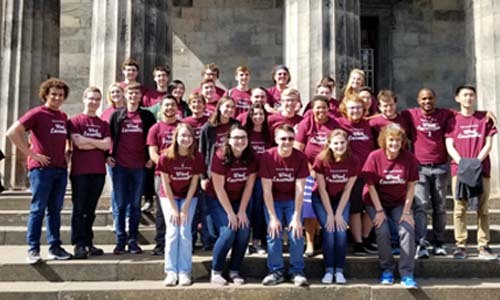 In addition to performing, students toured St. Andrews University and Cathedral, Cambridge University, Edinburgh Castle, Alnwick Castle, and Westminster Abbey; and they attended a concert by the Britten Sinfonia at the Barbican Centre in London. The tour also carried another benefit for students: COLL 300 credit for engaging deeply in the cultural traditions and exchanges.